So I know I said this right after the holidays and didn't totally follow through, but it's detox time. No, I'm not doing some sort of cayenne pepper/lemonade cleanse. No, I'm not doing South Beach Diet. But what I am going to do is not consume any alcohol for a few weeks (not even wine!) and I'm going to be eating a lot of veggies and fish. What brought this on? Well, a combination of things. Mostly it stems from the fact I've been on a lot of trips lately, and it's super hard to eat healthy when you're eating out all the time. (Chicken fingers, fries, and margaritas by the pool certainly don't help either). However...eating healthy doesn't mean eating gross diet food. It means controlling your portions and eating lots of green vegetables. I will never, ever, ever be able to cut cheese out of my diet, so that stays. I will just be choosing more low-fat cheeses for awhile (but NEVER non-fat...that's gross). That said...I present my latest creation: Zucchini Bites!! As you know from reading my blog, I'm a huge fan of the melon baller. I've used it for jello shots, I've used it for potatoes, I've used it for a lot of things. Here, it works perfectly for making your little zucchini "cups." What I did is cut each zucchini into about 1.5 to 2" pieces. I used the melon baller to carefully carve out a little spot for the filling to sit, making sure to leave about a half-inch "floor" at the bottom. Season the insides with salt and pepper. As for the insides that you scooped out, you can chop them up and add them to whatever you decide to fill them with. From there, just pop them in the oven for about 25-30 minutes, or until zucchini is cooked and everything is warmed through and serve! These would be great as an appetizer or a side dish. Pre-heat oven to 375 degrees. Cut each zucchini into about 1.5 to 2" pieces. Using a melon baller, carefully carve out a little spot for the filling to sit, making sure to leave about a half-inch "floor" at the bottom. Season the insides with salt and pepper. Use the "insides" that you scooped out, chop them up and add them to whatever you decide to fill them with. Heat olive oil over medium heat and saute onion and garlic until soft. Add the remaining vegetables and cook until spinach wilts. Season with salt and pepper and mix with ricotta cheese. 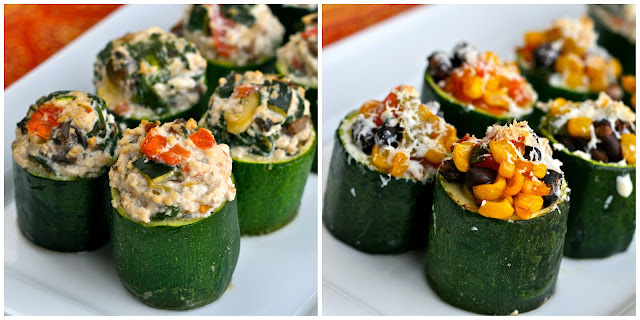 Stuff your filling of choice into the zucchini cups and bake for 25-30 minutes, or until zucchini is cooked through. Heat olive oil over medium heat and saute onion and garlic until soft. Add the remaining vegetables & beans and cook a couple minutes longer. A vegetable stuffed with even more vegetables? I'm so in!